Guntur houses the newly coined Andhra Capital of Amravathi, which lies about 30 km away. It serves as the administrative headquarters of Guntur district and has some unique distinctions to its name, having the largest chilli market yard in Asia being one of them. Guntur is also the third most populous town in Andhra Pradesh. With a busy industrial activity scenario, it forms part of the prominent Vishakhapatnam-Guntur Industrial corridor. It lies on the banks of River Krishna which melts into the sea further along the way. The city takes credit for housing the only Buddhist pilgrimage in South India which is situated in Amravathi. The city displays plethora of captivating relics of its past including Amravati Caves, Nagarjunakonda and many more. Also renowned as textile hub and transport hub of India, it is a center of learning as well. Once being the home to numerous great dynasties, today this city is more known for its industrial growth and exports of chili products to various parts of the globe. An ideal place for history lovers, Guntur was once occupied by several mighty rulers and today promises to take you back once again to the excursion trip of its glorious past. Kondaveedu is a place lying about 17 miles from Guntur city adorned with one of the most popular tourist attractions of the region. It houses an ancient fort belonging to 14th century AD built by Reddy kings which comprises of 21 magnificent structures. Situated on the top of the hill, the fort is source of pure admiration especially for the natural beauty surrounding it. The place also offers an ideal trail for trekking. A group of several temple located at the base of the hillock provides a captivating sight. Kathulabave and Gopunatha Temple are two of the many temples in the area. Guthikonda Caves Kotappakonda is a village, located 25 miles southwest of the Guntur City near Narasaraopet. Though the original name of the place is Kondakavuru, but it is popularly called Kotappakonda or Trikutaparvatam, a three-peaked hill nearby. Though bordered by many other hills, the Trikutaparvatam, also popularly known as Trikutadri or Trikutachalam can be clearly seen from any direction from a distance. The three peaks are named after the Hindu Triumvirate, Vishnu, Brahma and Maheswara. The Guthikonda Cave is an enigmatic place, which is of great excitement to explore. Sitanagaram is situated 16 miles North East of the Guntur City on the banks of River Krishna. The place is renowned for the famous Someswara Swamy temple. A place to admire large number of endangered species of Birds, Uppalapadu Nature Conservation is situated in the southern side of the city. Water tanks in the region are a perfect place to enjoy a beautiful spectacle of birds like Spot-Billed Pelicans and Painted Storks. The number of bird species has however has reduced in the recent time from 12,000 to 7000. Mangalagiri is a quaint town in the Guntur district of Andhra Pradesh. Literally translating to 'The Auspicious Hill', this place is one of the 8 important Mahakshetrams or sacred destinations in India. It is believed that Lord Vishnu had manifested himself on the very soil of Mangalagiri and Lakshmi Devi performed penance on the zenith of the hill as well. Owing to its legends pertaining to the divine, there is a tremendous footfall of believers here throughout the year. In addition to its Vishnu temples, places of tourist interest around Mangalagiri include Chinna Jeeyar ashram in Seeta Nagaram, Vundavalli Caves, Bhavani Island, Kanakadurga temple in Vijayawada direction and Jain Temple, Uppalapadu Birds sanctuary, Amaravati in Guntur direction. The Vaishnav temples of Mangalgiri attract devotees and pilgrims from all over the country. There are three Narasimha Swamy temples in Mangalagiri. The temple on the hill is that of Lord Panakala Narasimha Swamy and it is said that the lord has been worshipped since the beginning of the Satya Yug. It was formally built by the then Zamindar Sri Raja Vasireddy Venkatadri Naidu during the period 1807-1809 and it has completed 200 years of its construction. It was built by the then Zamindar Sri Raja Vasireddy Venkatadri Naidu during the period 1807-1809 and it has completed 200 years of its construction. As you move down the hill, you can see another temple dedicated to Lakshmi Narayan Swami here. This temple is a revered site of worship as well, and it is believed that the deity in the sanctum was installed by Yudhishthir himself. On the right side of the steps (provided to reach the temple), there is a stone inscription by Sri Krishna Deva Raya of Vijayanagar, and a little further up, the footprints of Chaitanya Mahaprabhu can be seen. Midway up the steps, there is a temple of Lord Panakala Lakshmi Narasimhaswamy where there is only the face of the deity with the mouth opened wide. A place situated about 16 miles from Guntur is packed with a famous holy shrine and site of great historic importance. The place itself is named after a renowned temple lying in the area namely Amareswara Swamy which inhabits Swayambhu Linga. Also situated in the vicinity is an ancient Mahachaitya Stupa belonging to 2nd century AD. 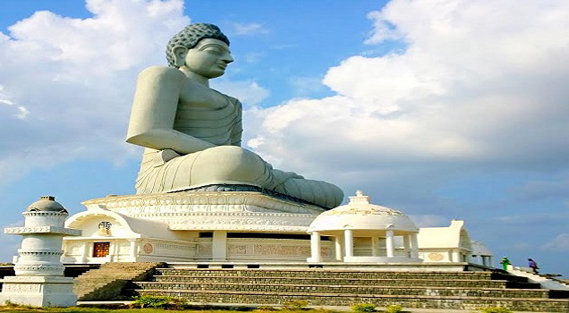 The most striking feature of the structure is cravings displaying life and teachings of Lord Buddha. A rich collection of terracotta antiques, old monuments and depiction of Buddha's life in pictorial form is an amazing addition to the museum I the stupa. The temple is further ornamented with fascinating inscriptions reflecting the relics of various dynasties that ruled the region. About 20 miles further is Bhattiprolu, a former kingdom of Prati Palaputra which is considered to be the earliest known kingdom in Guntur region. The city of Guntur is comprised of its own downtown area, midtown and residential areas. This place is packed with myriad of tourist attractions which include Center of Brodipet, Arundelpet, Jinnah Tower Center, Naaz Center, Brindavan Gardens, Old Guntur and Inner and Outer Ringroads. Manasa Sarovar lying in the eastern side of city is a man made park which also stands a striking feature of Guntur. Viswa Nagar is located to the South - West of the city close to Chowdavaram. The place is easily accessible by GNT - Chennai Express way (NH5). This is the place of Viswayogi Viswamji and the Universal Integration Pillar. The VIMS / Viswayogi Institute of medical Sciences, is also located here. Krishna Barrage, popularly known as Prakasam Barrage, is located around 18 miles away from the city of Guntur, built on River Krishna connecting Guntur and Krishna districts. On the other bank of River Krishna, is Bezwada, which is a twin city to Guntur. Both the cities provide major educational and medical facilities in the state. This region is also the prime transportation hub in the country.